At Cinema Vehicles, we know the role custom cars have played in some of the best movies in cinema history. A custom built vehicle is more than just a souped up car; custom designed and built vehicles require extensive fabrication and alteration, often with specialty graphics, additional parts, and rigging for stunt performance. From cultural icons to hilarious punchlines, we've put together a list of 5 of the coolest and most amazing car customizations from the movies. Some of these are Cinema Vehicles' cool custom cars, while some, built by other custom carmakers, have inspired our fabrication team. Let's explore how these cars were made, where they show up in the movies, and why they're so cool. To those who were involved in building the vehicles that inspired our team, we salute you! G.I. Joe is a well-known toy brand and has evolved over the years from toys to comics to now movies. 2009’s G.I. Joe: The Rise of Cobra was the first film in the revitalized series. Our team developed the seven G.I. Joe Humvees that were used during the film's action and crash scenes. The G.I. Joe armored Humvees are symbolic of the franchise's militaristic and espionage-laden universe Our team designed these Humvees to look more futuristic and tactical for the G.I. Joes’ modern day return to the big screen. Since the Joes’ missions take them anywhere in the world, we built the Humvees not only to look the part, but also to act the part. These vehicles appear in several of amazing opening scenes where the Joes and Cobra members face off against one another in a hectic skirmish. We armored each Humvee to withstand any special effects gunfire or bombs in these scenes. Those details add to the realism of the Joes' main mode of transport and are why our team has some cool car customizations. There are also some excellent close-up scenes where Duke and Ripcord are shown inside the Humvees talking to one another right and the display panels and internal work is in full view. And the Humvees can also be seen during an escape attempt in the Joes’ base where the Baroness evades capture after Cobra fighters rescue her. 2. Dumb and Dumber – Ford Econoline "Shaggin' Waggin'"
The 1984 Ford's Econoline van was nothing special on its own, however with some incredibly goofy modifications to the outside paneling, the Econoline transformed into the famous “Shaggin’ Waggin’. These vehicles were mainly used in the late eighties as company vehicles to carry cargo at an economical price as the name suggests. 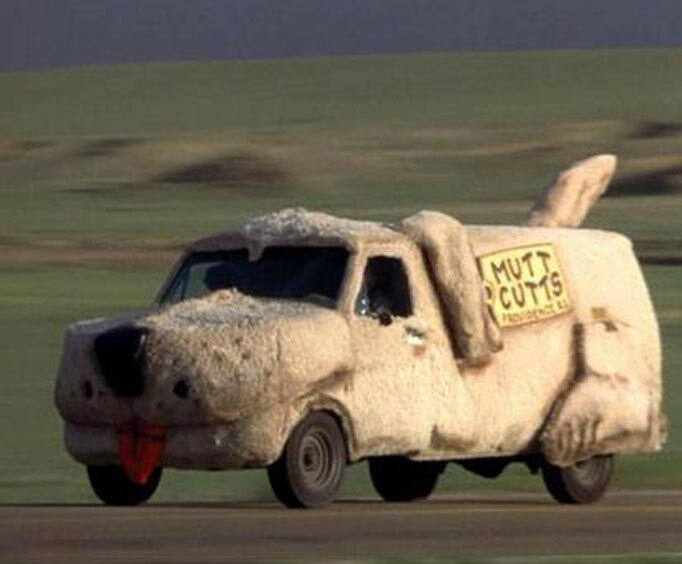 In Dumb and Dumber, the nickname for the van was the "Shaggin Waggin" because it was used for Harry and Lloyd's pet grooming business, Mutt Cutts. The van was draped in faux dog fur and resembled the shape of a dog with a wagging tongue in the front to boot. The van was also equipped with a look-a-like giant dog's nose, mouth, and ears. In the rear of the vehicle, side panel legs and a tail antenna complete this perfectly wacky custom car. The now famous "Mutt Cutts Providence RI" sign the sides displayed the company name and brand. Harry and Lloyd's crazy van appears within the opening scenes of the movie where their backstories are being told. We like this vehicle because it truly represents some of the cool car customizations possible in movies. The Hunger Games is a popular series of novels and movies based on the world of Panem, a dystopian future world set within the previously known United States. 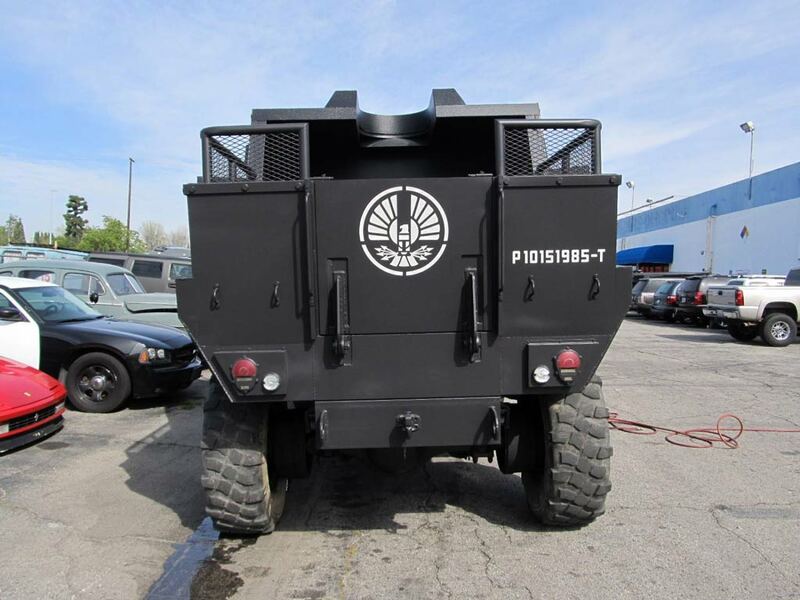 Our team enjoyed the process of bringing these Hunger Games Peacekeeper vehicles to life. 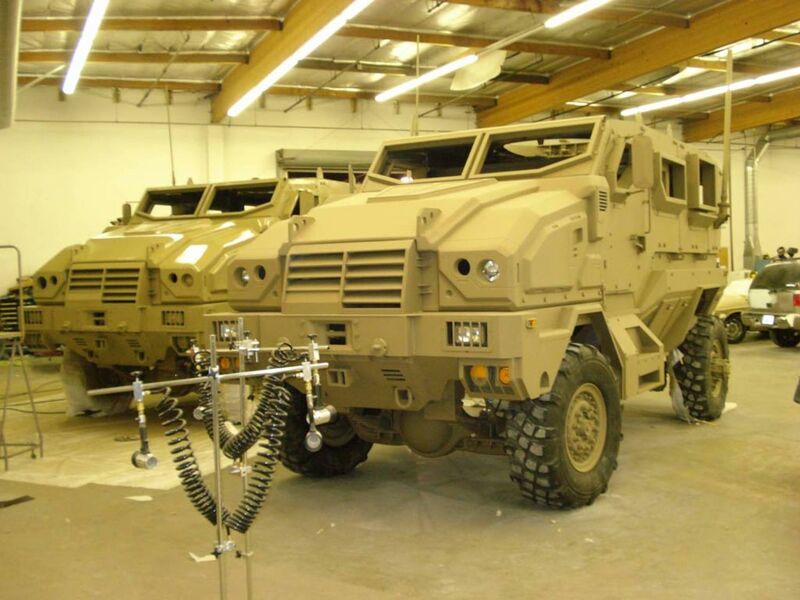 These vehicles are heavily armored Humvees used by the Peacekeepers to deploy across Panem to maintain law and order. The Panem Peacekeepers are essentially the opposition to Katniss Everdeen’s rise and rebellion over the existing government. The Peacekeepers' main transportation method is their SJ-7 Peacekeeper Assault Humvee. The Humvee was built off-road and tactical situations. Our team at Cinema Vehicles created the vehicle's specifications, which included 70mm bulletproof glass, a V-Hull design to withstand explosions, and a Granthom 12 liquid-cooled engine with a powertrain capable of generating 827 horsepower. Mainly appearing in the final three movies of the film series, The Hunger Games Peacekeeper Humvees attempt to stop Katniss from their rebellion efforts in Districts 11 and 12. 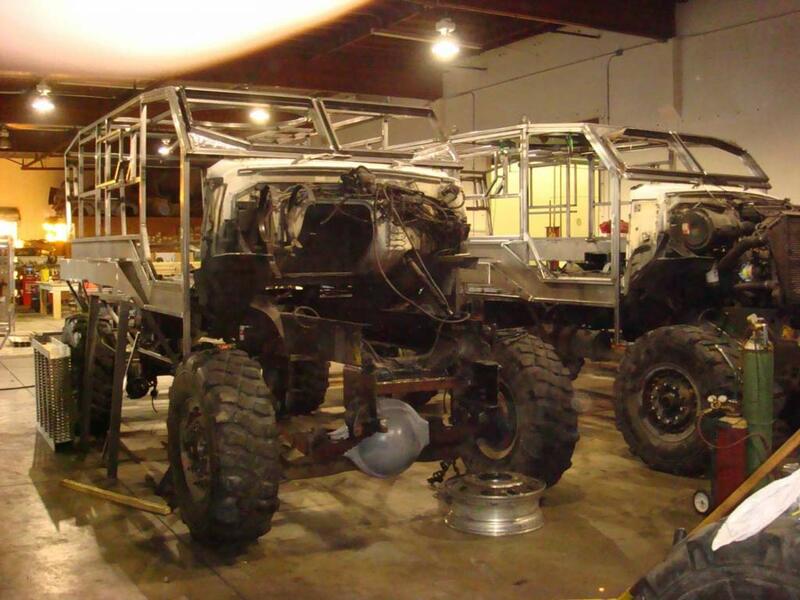 This was one of our team's biggest builds with over 10 Humvees customized for different shots in the films. We consider it also one of our cool car customizations because the vehicle styles were made to be realistic for the unbelievable world of Panem. 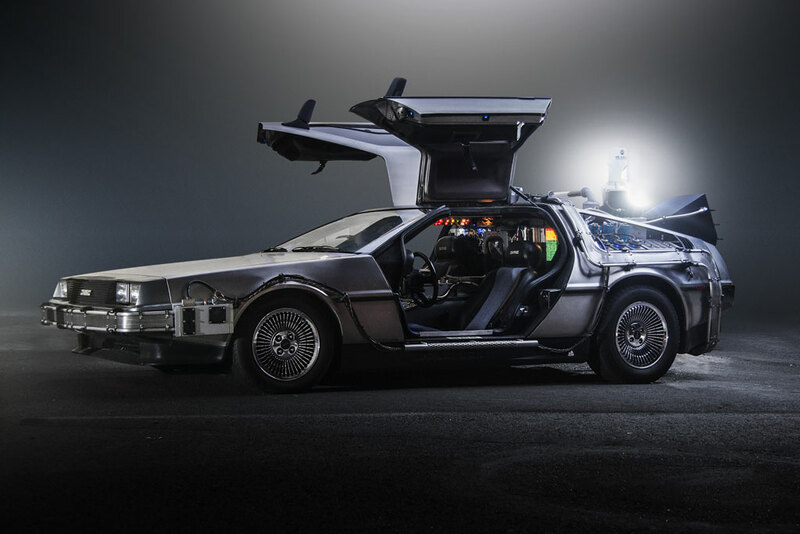 When you think about a movie car, you imagine the 1981 DeLorean DMC-12 from Back to the Future, don't you? It is one of those classic movie cars that has stood the test of Hollywood history. So, we should not even have to explain the reasons why we chose this car as one of the cool car customizations from the movies, but we will anyway. The futuristic looking car was designed and built by car modeler John DeLorean during the early 1980’s. The car itself had a limited run of only 9,000 DMC-12's over the course of three years. Even still, the car itself has lived on through Back To The Future. The DeLorean's gull-wing doors and sleek front to back design give the car an uncanny futuristic look. That is why movie producers chose the DeLorean to become the time traveling machine we all associate it with now. Throughout the movie, Marty McFly and Doc Brown use the DeLorean, equipped with a flux capacitor, to travel between the present 1985 and the past of 1955. Priest is a 2011 sci-fi action movie set in an alternate universe where vampires and humanity co-exist on the same planet, yet have been at war for centuries. The Priest is one of a group of rogue heroes who fight for humanity’s survival. The plot centers on the Priest's efforts to rescue Lucy, his niece, who has been captured by vampires and taken from their safe town. The local town sheriff, Hicks, aids the Priest on his journey to find Lucy. We created the bike that Priest and Hicks ride on in many of the movie's desert travel scenes. The motorcycle was made to correspond with the dystopic setting of the film. Our team had to build the bike to look like it was weather worn—complete with dust guards and beaten armor. The bike was made from a classic Suzuki racing motorcycle in order to fit the streamlined design scheme. 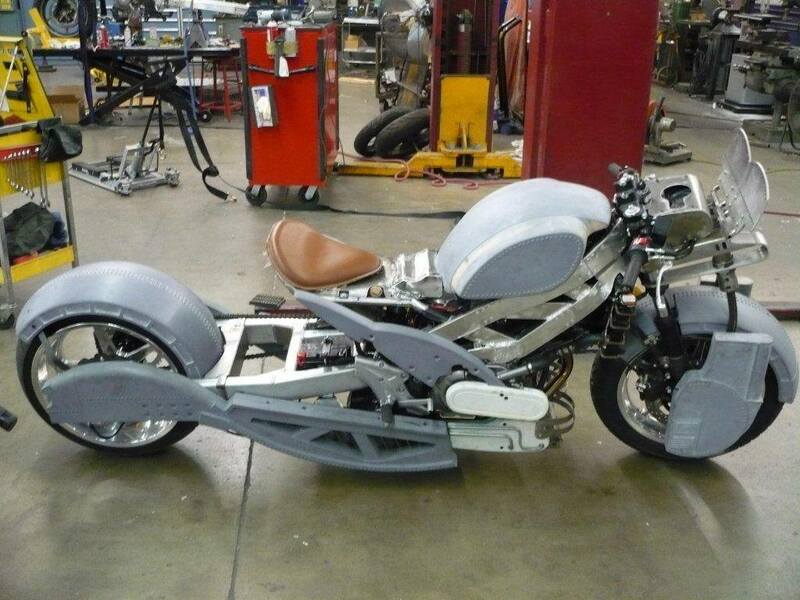 The reason why this bike made the list of cool car customizations is because the bike embodies the attributes of a dystopian thriller. From the weary outside look to the inner fire that ignites the struggle within the plot, the Priest movie bike developed the storytelling of the movie in a way that few cars do. Where Can I Find Cool Car Customizations Like These? No matter what genre you're into, movie cars have become stars in their own right. Our team at Cinema Vehicles loves to make these often-forgettable vehicles into stars. To learn more about Cinema Vehicles' cool custom cars we build or other services we offer, contact our team today.